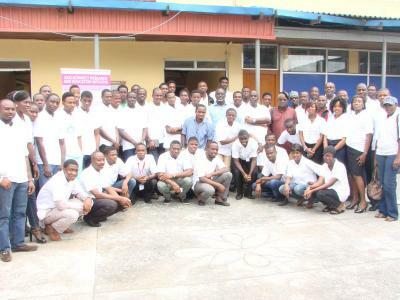 Successfuly hosted at the Center for Information Technology & Systems from September 23 – 27, the 5 day workshop was attended by over 40 selected students with about 50% from the host institution, University of Lagos. Other Eko-Konnect students came from Lagos State University, Yaba College of Technology, Federal College of Education (Technical), Akoka. Facilitated by volunteer consultants from Datasphir and prominent mobile application developers in Nigeria including Tim Akinbo, Kelvin Oguno, Sunday Akinsete and Wale Oyediran, the first 3 days of the workshop were technical and showed participants how to build mobile develops with on the android platform. Representatives from non government organisations and civil society organisations joined the developers on the 4th and 5th days. On day 4 , the stage was set with a review of the previous days followed by presentations and interactive discussions with NGO/CSO representatives on how mobile technology can be used to promote engagement in society and governance. The final day of the workshop began with presentations from the NGO’s and CSO’s showcasing activities and objectives of their respective organisations. They built on reflections from the previous day to share their ideas for mobile applications that could have social impact, improve governance and/or improve the efficiency of their work. Copyright © 2019 Eko-Konnect | Research and Education Networking.